An APC in The Ballad of Gay Tony. The APC (Armored Personnel Carrier) is an armored assault vehicle featured in The Ballad of Gay Tony. It is also commonly referred in game dialog as the NOOSE Tank. As The Ballad of Gay Tony restores the over-the-top style of Grand Theft Auto: San Andreas, the APC was created to fill a role similar to GTA San Andreas's S.W.A.T. The APC appears to be a Cadillac Gage Commando, with a flattened rear, and with the front end bearing a striking resemblance to a Russian BRDM-2. In terms of the APC's road-going abilities, the vehicle is evidently unintended for speedy travel. While the APC has a top speed of 60 mph (96 kmph), it possesses poor acceleration that dampens the APC's potential to reach its top speed and climb steep incline. On the other hand, its soft suspensions helps in providing the APC with generally reliable steering, especially at low speeds, and its brakes are also effective even in higher speed, impressive for a large and heavy vehicle like the APC; however, the suspensions' configuration increases the APC's susceptibility to rollovers due to uneven weight distribution during sharp turns. Its excessively heavy weight also allows the APC to push aside any small vehicle without much disruption in the APC's movement. 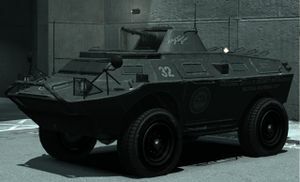 The APC is also the most durable vehicle in the game, being able to resist high speed impacts without any noticeable body deformation, and survive gunfire and even direct hits from up to four counts of explosive damage from rocket launcher rounds (despite the fact that the RPG was invented specifically to destroy tanks; this was probably done to balance the gameplay), explosive bullets or indirect explosions. While the APC is completely bulletproof in front of the back wheels, behind the back wheels lie the engine and air ventilation, which can take damage. Despite its apparent weakness in its armor, the APC can still withstand multiple magazines of light machine gun fire on the weak spot. If one were to destroy an APC, they should aim at behind the turret, at the air vents. The APC also has indestructible tires. Even though the APC has small but visible windows, shooting through them will not hurt the driver inside. 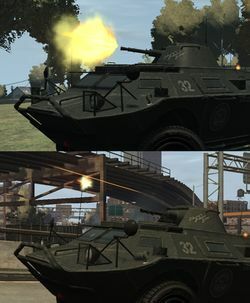 Comparison of muzzle flashes emitted by a regular APC (top) and the "machine gun" APC in "Frosting On The Cake". Note the misplaced flash on the latter. The APC's true strength lies in its prowess in combat, as the APC one of the most lethal combat vehicles in-game (still a step below that of the Buzzard, but can overwhelm the lightly armed Annihilator). In place of GTA San Andreas' S.W.A.T. tank water cannon is a turret loaded with explosive rounds, which is only as powerful as an explosive round shot from an Explosive Shotgun or Advanced Sniper. As little as two shots to any part of a car, and the car will catch fire. Afterwards, any medium-force impact will instantly explode the car. This is a mixed blessing. Catching a police car behind you on fire can make other police run into it, causing a dynamic chain explosion. However, doing the same to police cars in front has a price: one can find it hard to maneuver around the burning car, resulting in the car exploding on impact. Despite its well-apparent power, the APC has some minor drawbacks. Due to it being a special vehicle with severely limited window space, other weapons cannot be used, preventing one from throwing sticky bombs or passengers helping to fend off pursuers. The turret also has a limited field of view that is incapable of shooting high up into the air, where pursuing police/NOOSE helicopters may linger. "Frosting On The Cake" features an NPC-controlled APC that fires Micro SMG-like bullets as opposed to explosive rounds, imitating a machine gun (even emitting gunfire noises similar to those of an Micro SMG). Although the ammunition it uses is drastically different, the turret design is identical to those seen on other APCs in the game. In addition, the muzzle flash of the "Frosting On The Cake" APC's turret is significantly misplaced, flashing too far forward from the end of the turret. The Rhino was cut from The Lost and Damned but its design may have been based on the APC. In multiplayer, the APC is easily available in Free Mode, and there is a dedicated race class where all racers drive the APC, during which the player can use the cannon, albeit with a slower rate of fire and less power. Given its overpowering nature, however, the APC is not available in team deathmatch, deathmatch or other competitive co-op modes not directly related to the vehicle. An interesting way to blow things up is to put sticky bombs on some of the sides; then drive towards the target and press down on the d-pad. The APC will not be destroyed; instead, it will catch fire and blow up by ITSELF soon afterwards. The APC can be damaged by the extreme power of the swing glitches however, one probably wouldn't notice the damage unless one uses a health pack or the health cheat. Usually the front will suffer compression, pushing about it about half a foot into the APC. Although the APC is described on the official The Ballad of Gay Tony website as an APC utilized by NOOSE (National Office Of Security Enforcement) neither NOOSE nor the LCPD actually use the APC in-game to chase the player, except during "Frosting on the Cake". The APC appears in the missions "Caught with your Pants Down", where the player steals one for Yusuf Amir, and "Frosting on the Cake", where the player destroys one with Sticky Bombs to escape pursuing law enforcement after killing several Lost MC bikers. Can be obtained from Henrique Bardas via Luis Lopez' mobile after completion of "Departure Time", the last storyline mission. Only during multiplayer, in the parking lot of the East Holland police headquarters in Algonquin. The vehicle can be found parked underneath in a small garage with no garage door. At Yusuf Amir's construction site after shooting all 50 seagulls and after the mission "For the Man Who Has Everything" is completed. Can be spawned via the player's phone by dialing: 272-555-8265 (APC-555-TANK). S.W.A.T., GTA San Andreas equivalent. This page was last modified on 20 June 2012, at 17:50.